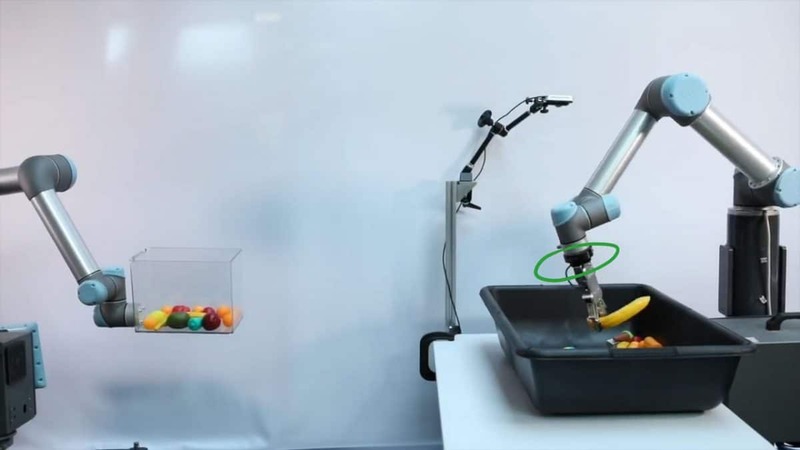 Researchers from Google, Princeton, Columbia and MIT have developed a picking robot, using a Millibar Manual Tool Changer, that can learn how to pick up and toss various objects into the right containers on its own. The robot, known as the “TossingBot,” incorporates the Millibar Manual Tool Changer to attach an onRobot Gripper. The Millibar Manual Tool Changer provides a reliable, stable connection, which is critical for the TossingBot’s ability to learn through trial and error, while integrating physics and deep learning AI. Not only can the “TossingBot” teach itself, but it is also speedy. “While state of the art systems achieve speeds of 200 to 300 mean picks per hour, we achieve more than 500,” said Andy Zeng, Student Researcher with Robotics at Google. Robotics research is on the rise as businesses rush to find new efficiencies in automation. According to Loup Ventures research, the industrial robotics market is expected to grow by 175% over the next decade. The Millibar Manual Tool Changer is a natural fit for research labs. Designed for high-mix, low volume production environments, researchers can effortlessly change end of arm tools, or move a tool between different robots, without tools, in seconds. Simply release the locking lever and slide a new tool into place. Millibar will demonstrate the Manual Tool Changer on April 8-11, in the Universal Robots exhibit, Booth #7154, at the AUTOMATE 2019 trade event at McCormick Place in Chicago, Illinois.